You're about to have a really big brown bag filled with some awesome deals. Bloomingdale's epic friends and family online sale started today — and you can get 25% off so much good stuff! We've scoured the site to find some of the cutest things, best deals, and splurge-worthy pieces. You'll get 25% off most brands and inventory — just check for the yellow tag on the product page. And on almost everything else Loyalists will get a $25 reward card on every $100 they spend. Plus, there is free shipping for everyone! But hurry, the F&F sale ends April 15! 1. 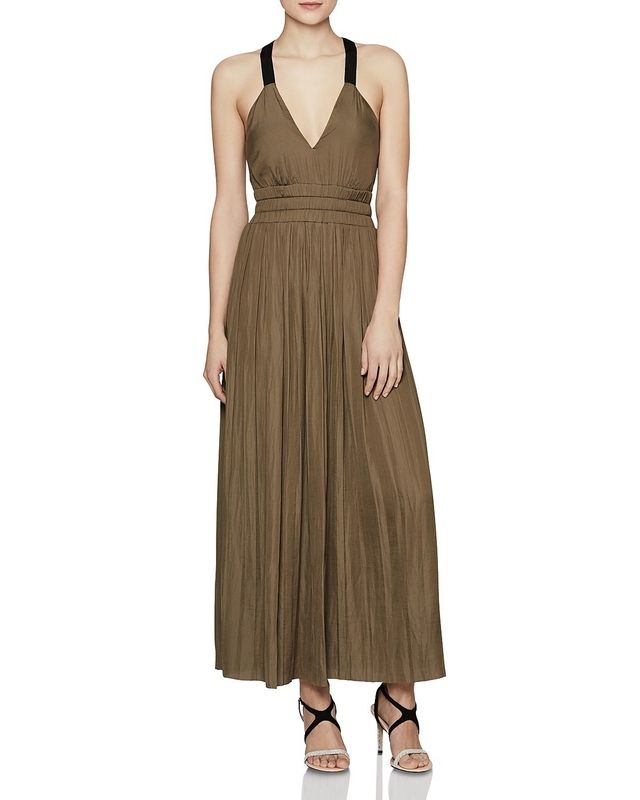 An ankle-length Reiss Frances dress with a stunning cutout back detail. Price: $277.50 (originally $370, available in sizes 0-10). 2. A lace-up faux-leather BlankNYC moto jacket so you can add the finishing touch to your cool-girl style. Price: $96 (originally $128, available in sizes XS-L and in black and white). 3. A super cute off-the-shoulder City Chic wrap dress made with adjustable straps that'll guarantee the right fit. Price: $74.25 (originally $99, available in sizes 14-24). 4. An adorable floral button-down Sadie & Sage A-line dress to get you totally ready for spring. Price: $58.50 (originally $78, available in sizes XS-L). 5. A classically beautiful faux-wrap Aqua maxi dress so you always have something chic to throw on. Price: $66 (originally $88, available in sizes XS-L). 6. A pair of mid-rise 7 for All Mankind Roxanne jeans with a step hem and a perfect amount of stretch. Price: $112 (originally $199, available in sizes 25-32). 7. A ruffled Junarose floral-print dress you'll wear more often than you'll want to admit. Price: $44.44 (originally $79, available in sizes 14-24). 8. A rainbow-striped Aqua maxi dress for just the perfect amount of color to brighten any day (or outfit). Price: $118.50 (originally $158, available in sizes XS-L). 9. A pair of cropped NYDJ skinny jeans with a contrasting hem detail and the most comfortable stretch you'll ever wear. Price: $89.25 (originally $119, available in sizes 14W-24W). 10. A cotton Bravado graphic tee you can wear while you're walking around grabbing your you know what, flippin' the you know who. Price: $28.50 (originally $38, available in sizes XS, M, and L). 11. A practical AF Avec Les Filles patent raincoat, because you really need one in your arsenal of jackets — so why not get it while it's on sale? Price: $111.75 (originally $149, available in sizes XS-L and in blush and yellow). 12. A cutout-detail floral Bardot midi dress that'll 100% keep you cool through spring and summer. Price: $81.75 (originally $109, available in sizes S-L). 13. An asymmetrical, floral Whistles ruffled skirt I am almost certain was meant to be worn while you dance the night away. Price: $224.25 (originally $299, available in sizes 0-12). 14. A charming silk Joie Diondra top you'll easily be able to dress up or down for any occasion. Price: $111 (originally $148, available in sizes XXS-L). 15. An adorable Aqua heart-print raincoat, because you're one of the very few who just loves the rain. Price: $73.50 (originally $98, available in sizes XS-L). 16. A floral-print Sadie & Sage ruffled dress to wear to all those weddings — so. many. weddings. 17. A knit Rebel Wilson x Angels jacquard pencil skirt made with a super-comfortable elastic waist and fun grid design. Price: $73.50 (originally $98, available in sizes 0X-3X). 18. An embroidered bell-sleeve Aqua maxi dress for when you want that glam AF boho look. Price: $83.25 (originally $148, available in sizes XS-L). 19. A cozy AF C by Bloomingdale's cashmere hoodie to have you wrapped in luxury at a reasonable price. Price: $111.40 (originally $198, available in sizes XS-XL and in six colors). 20. A ruffled-trimmed Aqua midi dress that'll have you looking like you have tea parties on the weekend. Price: $88.50 (originally $118, available in sizes XS-L). 21. A sheer Belldini bomber jacket designed with a ribbed-knit trim and floral embroidery. Price: $70.50 (originally $94, available in sizes 0X-3X). 22. A layered lace Sandro midi skirt you'll look absolutely graceful in. Price: $148.13 (originally $395, available in sizes XS, M, and L). 23. A breezy crochet and lace Aqua dress for all those hot summer days. 24. A classic wool Vince Camuto hooded coat you should buy for next year now, while it's on sale. Price: $121.86 (originally $325, available in sizes XS, M-XL). 25. A ruffled cold-shoulder Rebecca Minkoff sweatshirt so you can look pulled together while you live that I don't want to do anything life. Price: $42.53+ (originally $108, available in sizes XXS-M and in pink and black). 26. A plunging Red Carter bikini that'll stay in place and keep you looking flawless poolside. Price: Get the top for $58.20 (originally $97, available in sizes XS-L) and the bottoms for $48 (originally $80, available in sizes XS-L). 27. A smocked Aqua paisley jumpsuit designed with an elastic top to give you a totally perfect fit. 28. A pair of suede Sam Edelman slides that'll give you height while keeping you super comfortable. Price: $82.50 (originally $110, available in sizes 6-10 and in pink and black). 29. A lace-up Lucky Brand top to help complete a very awesome rendition of your everyday uniform. Price: $37.13 (originally $49.50, available in sizes 1X-3X). 30. A ballerina-style Becca one-piece bathing suit, because your dancing days aren't over just yet...okay, even if they are this suit is super cute so whatever. Price: $93 (originally $124, available in sizes S-L). 31. An off-the-shoulder Re:Named eyelet top you'll have to take with you on vacation — like, it's not a choice. Price: $51 (originally $68, available in sizes S-L). 32. A mini leather Furla crossbody that'll fit everything you need when you're on the go! Price: $223.50 (originally $298, available in seven colors). It's always nice to spend time with friends and family — especially if those friends and family are named Bloomingdale's! Check out even more awesome sales.